And now for something different… LEGO Dimensions! Those of you who follow my blog know that I generally review books and audiobooks, so this review is somewhat different. Today, ladies and gentlemen, I will be discussing LEGO Dimensions, the new video game from the folks at LEGO and Travellers’ Tales. My playing this game has seriously eaten into my reading time. For those of you who have never played a LEGO video game before, they are level-based humorous games in which you smash objects to create the solutions to puzzles. They are a lot of fun. You unlock in game rewards by collecting mini-kits, red and gold bricks and LEGO studs which you can exchange for new characters with different puzzle solving abilities and other new abilities to solve more puzzles to unlock even more stuff. 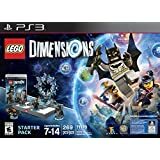 Dimensions is rather different in that it’s the company’s first foray into the toys-to-live world meaning that you must fork over hard cash for real-world LEGO sets to unlock the characters and content in the game. The starter pack includes the game, the toypad. the bricks to build the Dimensions portal and the Batmobile and the mini figures of Gandalf from Lord of the Rings, Batman from DC Comics and Wyldstyle from the LEGO Movie. Gameplay is divided between the fourteen levels of the main storyline each based on one of the fourteen franchises in Dimensions, additional franchise specific levels and fourteen free roam Adventure Worlds each specific to one franchise. In order to access the franchise specific content you need to purchase additional LEGO sets which come in Level packs (to access a new level and which contain one character, one vehicle and one gadget) team packs (with two characters, a vehicle and a gadget) and fun packs containing one character and one vehicle. . Each of the team/fun packs gives you access to the Adventure World of that franchise. So for example, by purchasing the Wicked Witch fun pack for $14.99 you gain access to the Oz Adventure World. Of the 14 Adventure Worlds, the starter pack only gives you access to three, and none of the franchise specific level packs. This is a serious limitation and something to be seriously considered. Personally, I supplemented the starter pack with the Wonder Woman, Wicked Witch, Gollum, Gimli and Cyborg fun packs, the Scooby Doo team pack and the Back to the Future level pack. I have preorders placed for the Doctor Who level pack, the Ghostbusters level pack, the Doc Brown fun pack and the Cyberman fun pack. These have not yet been released. First, it has to be said the game is a heck of a lot of fun. There is so much humour in the game, at levels which will appeal to both younger and not so young players. Having the real world component makes the experience very interesting – at several points you have to put down your controller and go and physically put together LEGO bricks to continue the story. The toypad is also heavily integrated into the game and is used as far more than a way of introducing characters into the game. You are constantly moving characters around the toypad to solve puzzles. It is very ingeniously done. One of the joys of the game is the mashups that are created between the 14 franchises. It leads to some hilarious moments. For example, it turns out that Wyldstyle and Wonder Woman enjoy bonding over girl talk and coffee and Gandalf is annoyed at the Wicked Witch for giving magic users a bad name and he suggests she tone down the evil! I have definite plans to take The Doctor joyriding in the Batmobile through the streets of Minas Tirith as soon as the Doctor Who pack is released. Having said that, the constant blocks because you haven’t purchased a certain character with a certain skill set are tedious and frustrating in the extreme. One of the first puzzles you come across in the game is a swarm of ghosts which the game, very helpfully, tells you can only be dealt with by Peter Venkman whom you can obtain by forking out $30 for the Ghostbusters level pack, which isn’t even available until January 2016. You are constantly faced with such roadblocks, and, while they don’t prevent you from completing the main story adventure it becomes very, very tedious after a while. There is a lot of enjoyment to be had in the game – I’m still getting a lot of fun out of it several weeks later – but if you purchase it, be aware that your experience will be rather limited unless you are prepared to fork out lot more money than that for the already expensive starter pack. I gave LEGO Dimensions four stars out of five.